Vitamix is a company that has won trust of people all over the world as the producer of the best kitchen appliances. Blenders from Vitamix have gained immense popularity. If you are looking for durable, high performing blender for your kitchen, you should definitely consider Vitamix. Vitamix has recently released the Vitamix 7500 which has become quite popular in the market. Maintaining the quality that Vitamix is well known for, and using the innovative technology that has been used in the previous products, the company has added some new features into this model that makes it a must have! While the Vitamix 5200 was quite well-received by the people in general, there were some issues with the model that people complained about. Vitamix believes in keeping its customers satisfied and so addressing the complaints of the users, the company released Vitamix 7500. It is basically an upgrade on the 5200 model and you would see a lot of improvements in this model. The most prominent difference between the Vitamix 7500 and the earlier models is its dimensions. The model is shorter than its predecessors with the height of 17.5’’. The blender measures 7.7’’ in width and 9.4’’ in depth. Despite its shorter height, the blender is heavier than the other Vitamix blenders. This is because Vitamix 7500 has been fit with a very powerful motor that can help you chop up faster. 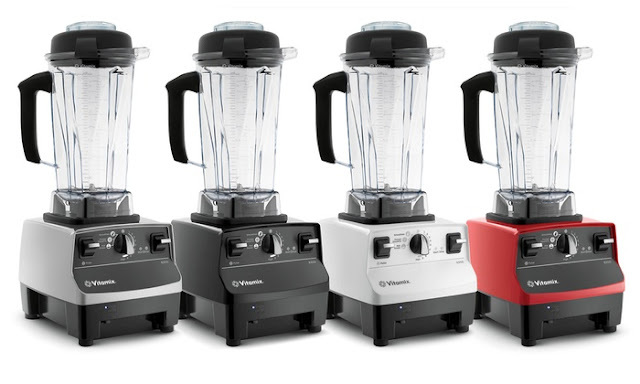 Equipped with a 6-foot cord, the base of Vitamix 7500 is available in three colors; black, white or red. If you are thinking about buying the new Vitamix 7500 then you should research its specifications in detail to find out whether or not it would suit your needs. So read on, as we are going to do talk about the specifications of the Vitamix 7500 in more detail. The Vitamix 7500 comes with a powerful motor as we mentioned earlier. The blender is able to produce 2.2-peak horsepower at the 12 amps. With the increase in power, the blender is able to produce more speed than its predecessor. With the maximum speed of 270 miles per hour, the Vitamix 7500 reduces the processing time and can chop everything perfectly. The blades are designed to create a vortex that starts pulling the ingredients as soon as you turn it on. In addition to better functioning, efforts have been made to resolve the issue of sound that users of previous models have complained about. The Vitamix 7500 produces 40% less sound than the other models. If you have been using a noisy blender all your life, using the Vitamix 7500 would feel magical. When you use the Vitamix 7500 you find that you can even mix and blend the most difficult ingredients and in a very short time. The powerful motor works quietly which makes the Vitamix 7500 a perfect blender for both professional and domestic kitchens. The main difference between Vitamix 7500 and the previous models is the low profile container which was designed especially for this model. Made from the BPA- free polycarbonate like the other blenders from Vitamix, the 64-oz container has been redesigned to be shorter and wider which makes it easy to be sstored in cupboards. The similar Vitamix lid comes with this model as well which fits snuggly over the container and prevents leakage. And you can easily use the container for storage of ingredients as well. The removable center lid makes it easy to add more ingredients while the blender is on. The increased width of the container ensures more ingredients reach the blades, which makes the blender work faster and better. Despite the innovation in design you would still need to occasionally scrape the ingredients down towards the blades with a spatula. The wider and shorter design also makes cleaning up easier. If you are tired of using the old fashioned blenders and you find it difficult to clean your long container, then try the Vitamix 7500 with its innovative container. Despite its shorter size the capacity of the container remains same, and you can blend large amounts of ingredients at the same time and more effectively. If you have used the Vitamix blenders you would know that their controls are easy to use and even beginners can figure out how to use them. The latest model from Vitamix feature the familiar controls but they have been improved. The high variable toggle has been replaced with a better pulse toggle. You would find the rest of the controls to be familiar. The new pulse toggle allows you to change the speed quickly during blending, which gives a sudden burst of power needed to mix the ingredients completely. This feature would come in handy during making salsas and pastes. Now you don’t have to flip the switch on and off or keep on twisting the dials to change speed. All you have to do is change the pulse the way you want to. All the switches and toggles are made with durable material so they don’t break off easily after use. Vitamix blenders are renowned for their durability which makes a great investment. With its sturdiness, high performance and easy to use controls, the Vitamix 7500 has all that you want in your blender and more. A true whole food Blender – this truly crashes everything, skin and seeds are no issue. For those of you who would like to eat the entire piece of fruit/vegetable OR don’t want to spend extra time peeling away just to blend it up, then this is for you. This blender even handle raw carrots and celery without any issues. The only thing it does not appear to eliminate, from the user reviews, are blueberry seeds. So that was all you needed to know about the Vitamix 7500. It is the latest thing in the market and would definitely be a great addition to your kitchen. People all over the world who have used this model have praised its compact design, powerful motor with minimum sound and the innovative features specific to it. We recommend the Vitamix 7500 to all chefs, whether you are a professional at a big restaurant or like to experiment with cooking at home; the Vitamix 7500 would make cooking a lot more magical for you. Its features make it different and better from other blenders and you should give it a try. We hope that this guide would help you make a decision whether or not you want to buy this awesome blender.